The skin around the eyes is extremely thin, sensitive, and prone to dryness. Dry skin usually develops wrinkles and fine lines faster than other skin types so the area around eyes usually show the first signs of aging. It is difficult to hide dry skin around eyes using makeup. 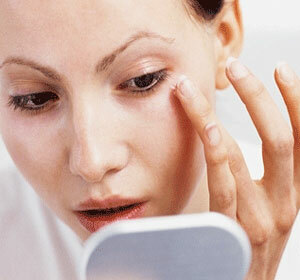 In fact, heavy makeup can make dry skin and wrinkles under eyes more noticeable. – Absence of sufficient oil glands: The oil glands secrete sebum, which keeps the skin moisturized. The skin around the eyes has fewer oil glands than in other parts of the body and so is susceptible to dryness. – Aging: Our normal aging is a major factor of dryness. As we age, the skin produces less oil and thus becomes drier. – Medical conditions: Diabetes, psoriasis, and hypothyroidism can cause dry skin on your face and under the eyes. Malnutrition such as vitamin A deficiency can also lead to dry skin around eyes. – Improper cleansing: Using harsh eye makeup remover and cleanser can strip moisture from the skin, resulting in dryness. The dry skin problem becomes worse when you cleanse your face too often. – Smoking: Smoking increases free radicals that damage the skin. The damaged skin causes water loss, causing dry skin condition. – Too much alcohol / caffeine: Excess intake of alcohol and caffeine can also contribute to dry skin. – Environmental factors: Prolonged exposure to the sun causes the skin to dry and have wrinkles because sun’s rays induce free radical formation. Dry skin is also common during winter or in other conditions when humid levels are low. The dry air enhances evaporation of moisture from the skin, making it dehydrated, dry, or even flaky. – Remove eye makeup with an oil-based or moisturizing eye makeup remover. – Use a gentle cleanser with neutral-pH. Don’t use too hot water because it strips natural oils from the skin. – Apply a good eye cream. Important ingredients to look for in an eye moisturizer are Coenzyme Q 10, vitamin E, Babassu wax, and/or Homeo age. CoQ10 and vitamin E are antioxidants which help fight harmful free radicals. Babassu wax forms a barrier that traps moisture in the skin and repels dirt and grime. Homeo Age is found in the extract of a brown alga found in Canada. It is rich in antioxidants, minerals, and vitamins. Many people have found that petroleum jelly works well for the dryness around the eyes. Petroleum jelly well absorbs into the skin because it has a melting point just above body temperature. It protects the skin from the effects of exposure and let the natural moisture to build up inside the skin. – Use an intense eye mask once a week. Eye masks such as Clinique Moisture Surge Refreshing Eye Mask can rapidly soothe and hydrate the skin around eye. – Drink plenty of water throughout the day to keep your skin hydrated. – Eat healthily. Consume foods that are rich in vitamins A, C, and E, and Omega-3 fatty acids. Vitamin A, C, and E are antioxidant vitamins which not only promote healthy skin but also fight free radicals that damage the skin’s cells. Omega-3 fatty acids provide you the good fats your skin need. – Use a humidifier during winter. – Limit alcohol / caffeine intake.